Lance telling Amy he's been thinking about her. Amy suggests they can do something together when they get back from camping. Phil in the loft being stung by wasps. Phil staggers down the ladder. Lance shuts the loft hatch. Phil warns him not to come close as Lance is allergic to wasp stings. Lance runs off to get Karl. Drew is visiting Joel. He shows Drew the letter from Dominator Sports. They have sent him a programme of forthcoming events. But Joel is pessimistic about his injuries. Karl comes in and Joel asks for news about his condition. Karl says the specialist will be along in a minute to discuss it. Drew tells Karl that the Thunderbird will be very expensive to repair. To Drew's surprised, Karl says that the time has come to get rid of the Thunderbird! Joel asks Karl if he'll stay until the specialist gets there. Karl says he will as, “noone else needs him”. Phil is sweating and swelling up. Amy comes in and is shocked to see him on the floor. He is trying to inject himself with Lance's adrenaline on the advice of the emergency services. He asks Amy to do it but she can't do it. Phil begs her. Lance runs in and gives Phil the injection. Joel's knee might need a reconstruction as a worst-case scenario, but they need to wait and see. Joel is very pessimistic. 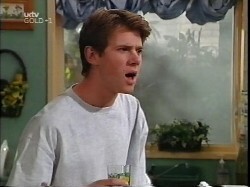 Lance is cross with Amy for panicking – Phil's life was in danger and she should have got over her phobia. Amy is upset – if she could have done it she would have. She leaves. Phil is in bed with Karl tending to him. Phil is feeling better and thanks Lance for injecting him with the adrenaline antidote. Karl says Lance was lucky too – that he didn't get stung himself. Karl suggests that Lance stays with him until the wasps are gone in case he gets stung. Karl asks how Lance's glandular fever is and it seems it is a bit better. They leaves Phil to rest. Madge has found a goose entangled in a plastic bag. She helps it escape and tells the goose she is going to call him “Lou”! The goose follows her. Lance is staying with the Kennedys overnight while the fumigators are dealing with the wasps. 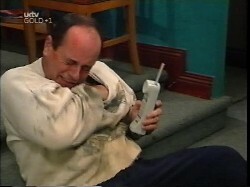 Lance enquires after Eric the Idol and Karl claim there was a break-in and that was the only thing taken! Karl gets flustered as he tries to cover and asks Lance not to say anything to Lou. Amy comes in as Karl is leaving. She asks Lance to understand about her needle phobia. Lance is still frosty with her, but he thaws a bit, offers her breakfast and apologises. He tells Amy that he has missed her. Amy tells him that she thinks it will be better if she and Lance are just friends. The Dominator Sports guy is visiting Joel. He tells about triathlon dates coming up, and asks Joel if he'll be OK for those. Joel says that he will, but he looks worried. Amy says she has thought about him and she needs a lot of space. Lance says he's given her space. Amy says she feels like she is being squashed on all sides and she just wants to be herself. She says people are trying to mould her, while she wants to be her own person. Lance is clearly very upset. He tells Amy this time it's over for good – even if she changes her mind again, she's not worth the heartache. The Dominator Sports guy introduces himself to Karl. He asks for information about Joel's condition but Karl says he can't tell him because of confidentiality. They chat a bit about knee reconstruction and Karl says he hopes Dominator wouldn't dump Joel, whatever happens. Harold is testing St. John's Wort – apparently it has healing powers. He and Lance think it might help with Phil's stings. Madge says she's more concerned about their business – the Coffee Shop is empty at lunch time. Then Madge realises that Lou the goose is sitting outside “guarding” the Coffee Shop and hissing at all the potential customers, putting them off. The guy from Dominator Sports is back visiting Joel. 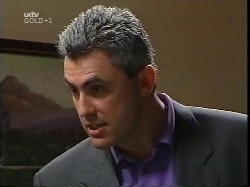 He gets angry with Joel and says he knows that Joel's condition is more serious than he said (he has put two and two together). Joel says he told him everything he knew but was looking on the bright side a bit. The Dominator Sports guy gets a bit shirty and tells Joel that Dominator Sports are a small company and all the people they sponsor have to be at peak fitness. Lou the goose is still guarding the entrance. Karl manages to get in and tells Madge that his patients can't get to the surgery. Karl suggests that Madge cooks it(!). Amy comes in. She tells Karl that she's got a phobia of needles. He suggests hypnotherapy. He takes her off to discuss it. 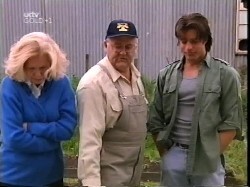 Madge has got Drew to catch the goose in a box and release it on the allotment. 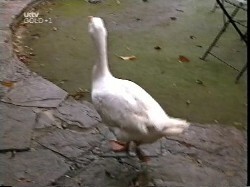 Harold says he's got a way with animals – first Karma the horse and now Lou the goose. Harold is disappointed to hear that geese are vegetarian – he might eat Harold's plants! He says the goose will have to go somewhere else. Drew suggests that he could build him a pen. As Madge leaves, the goose follows her! Joel is very depressed. Karl comes in with the tube he used for Joel to breathe through in the river as a souvenir(!). Joel tells him that Karl has given the Dominator Sports guy the impression that his injuries are serious and now he's cancelled Joel's sponsorship. Joel is angry – he says Karl has wrecked his career and to get out of his room. When Karl goes he rips the drip out of his arm and gingerly gets out of bed and tries to walk. However his leg gives way and he collapses on the floor looking pained.